Dozens of other individuals have fallen victim to Cox’s bizarre pattern of online harassment. Ms. Cox identifies her victims, registers multiple domain names using their full names, and baselessly accuses them of a variety of wrongdoings. She informs her victims that she will not cease her false attacks unless they agree to purchase her “reputation management” services. If they do not purchase those extortionate services, she escalates her baseless accusations against them. Sadly, a $2.5 million jury verdict against Cox for those online activities hasn’t seemed to deter her. In fact, it appears to have emboldened her. First she started her extortion plot against Randazza, asking him to pay her a large sum of money, and posting defamatory content on marcrandazza.com when he refused. Cox then registered at least 31 more domain names with all or part of the names of plaintiffs. 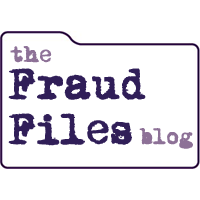 Defamatory content was added to those websites in an attempt to damage Randazza’s reputation and mislead those who might be using a search engine to find Marc Randazza. Crystal Cox’s pricetag to stop the Randazza madness? $5 million. And she told the public that she’d keep registering domain names related to Randazza’s name unless a court stopped her from doing so. As Cox targets many other individuals with her extortion scheme, the intent to profit is clear. Cox, on information and belief, when targeting other individuals, shows them what she is doing to [Randazza] and his family and uses this as a basis to extract or attempt to extract extortion fees from other third parties. Randazza also says that Cox tried to stop him from testifying in a deposition related to one of the lawsuits against Cox. 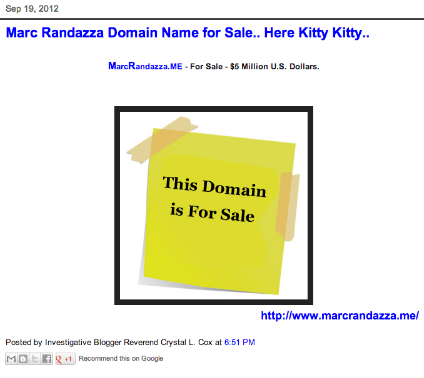 And Crystal Cox says she owns “a few hundred” domain names related to the Randazza name. Interesting, isn’t it, that she can’t pay the $2.5 million judgment against her in the Obsidian Finance case, but she can pay to register all these domain names? Marc Randazza has filed for a temporary restraining order against investigative blogger Crystal Cox, seeking to prohibit Cox and Bernstein from using the Randazza names, trademarks and domain names. 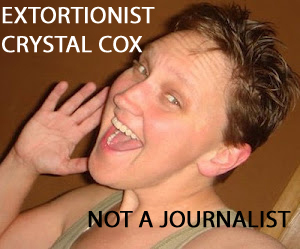 Of course, Crystal Cox filed an objection in her “Pro Se Capacity” as she always does. Notice also that Cox is now “a Media Defendant” and “protecting the Public at Large.” Cox tells the court that it can’t possibly issue an injuction because “there is massive information that needs to come out.” OH NOES!!!! Crystal says the arbitration decision in favor of Marc Randazza is Fraudulent. (Yes, with a capital F.) And Cox is “filing a legal action out of Switzerland.” I can’t wait to see how that turns out. After all, Crystal has been so effective at representing herself thus far in the U.S. legal system. Surely she’ll do just as well in Switzerland. And let’s not forget that Marc Randazza has “Committed a Hate Crime” (yes, all capitals left intact) against Cox. And he has “Mafia ties” too! There is one important take away here. We would all be wise to own our own names on the Internet, although maybe not hundreds of versions of the same thing. This will be interesting to watch! I agree with you in theory, but there are tons of different ways someone could take your name and make it into a URL. I’ve bought the most obvious domain names using my name, but creativity by nutjobs like Cox knows no bounds.